Johnny Boy picked me when I arrived at the foster mom’s house. 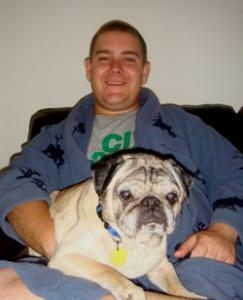 He has adapted to my schedule wonderfully, and had a blast over Thanksgiving when he met the other 3 pugs in my family. He is quite silly and headbutts me when he wants attention. He can easily jump on to the couch, but prefers to slap me until I pick him up and put him on my lap to watch TV or Playstation! I’ve never seen such a pleasant and easy going dog in my whole life! Thanks CPR!